"To practice art, no matter how well or badly, is a way to make your soul grow. So do it." This is exactly what I do..practice and practice different forms of art for some time and get lost in it to nurture my soul. In continuation to my previous post, this is Part 2 of DIY stone art and its about theme painting on stones. Chose any theme as per your interest/requirement and proceed with acrylic paints on these stones. In the below pic you see some scenery painting, inspirational word/quote and two owls. For scenic/ landscape themed painting you can check this video tutorial. You can search in youtube, type tutorials for painting stones and the search results will display n' number of videos. 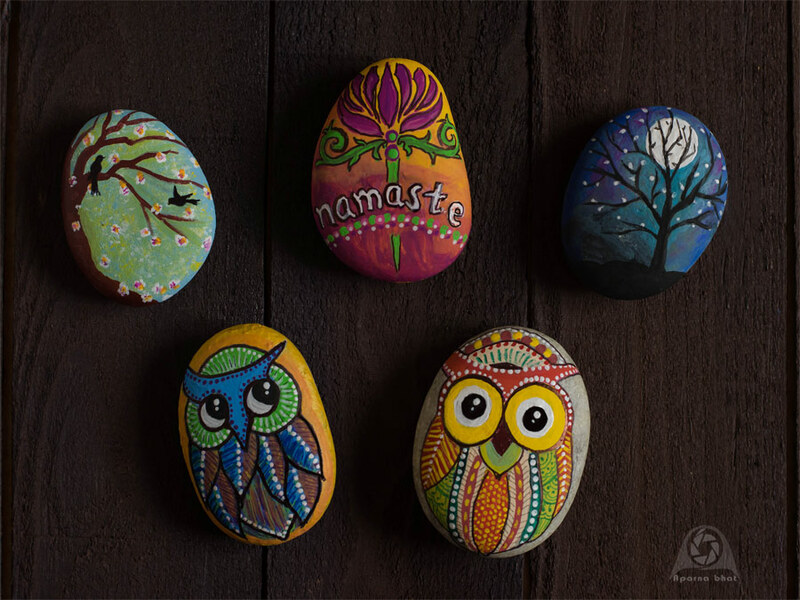 Pebbles painted with bright colored paints can be means of creative expression and joy especially for kids. So plan it as a summer/vacation/ craft activity for your kids to keep them entertained and busy. Do no strain your eyes and back. So take rest at intervals as you proceed with the painting. Make sure you use good lighting/ sit in well-lit room. After the painting dries completely, apply a coat of varnish to seal the colors and make it waterproof as well as dust proof.